The development of cheaper building design and temporary or affordable housing modules has gathered pace at a rapid rate this century, and now, one housing solution offers a Lego-like building experience. French design and architecture firm MultiPod Studio has unveiled a prototype for the PopUp House which is a customisable house made from stackable blocks. The blocks are insulating blocks sealed with wooden panels. 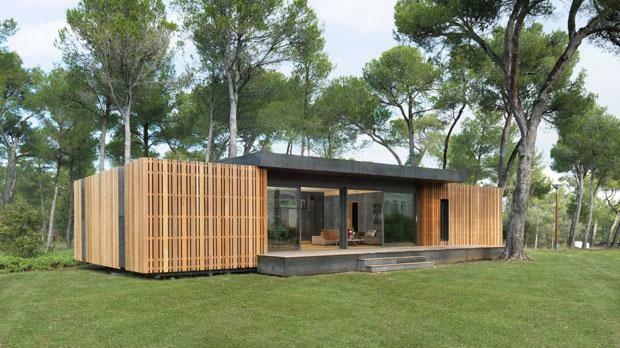 The entire structure of the PopUp House can be made by assembling these blocks. The designers promise rapid installation with no special tools required and an assembly feel a lot like Lego bricks. A home can be designed, ordered online, and built in roughly a month. The house is estimated to cost between US$1200 to $1900 per square metre depending on your needs and quality required. All construction materials are recyclable and held together with wood screws. "A PopUp House can be whatever you wish it to be: a small and cozy country lodge, an urban two-story house, or a spacious open office," co-founder Corentin Thiercelin told Tech Insider. For now it is available just in France but is expected to be available in the UK and USA shortly. The PopUp House was devised by Thiercelin in response to wastage observed in building a frame and then insulating it afterwards. Part of the passive construction movement its energy consumption per square metre is very low. A comfortable interior climate can be maintained without active heating and cooling systems.